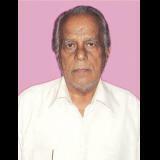 Pundit Dasharathi Dash is a well known sanskrit scholar of Orissa, for having translated many divine books like Sringartilakam, Srimad Bhagavatam etc. in oriya language both in prose and poetic form. This book is the second canto (Dwitiya Scandha) of Srimad Bhagavad Mahapurana, describing the cosmic manifestation from the celestial gigantic body of the Supreme God. This book has been widely praised so many oriya scholars and literary associations.